I haven't been able to post for a few days, partly because I've been too busy, but mostly　because Blogger blocked this site using its clever spam-prevention tool. Apparently my blog has all the hallmarks of being written by a spamming robot - not impressed. This has to be a quick post but I wanted to update on my current whereabouts. In fact my exact whereabouts are in the flat in which I've just couchsurfed, but more of that soon. On Wednesday I lugged my now considerable quantity of luggage (including whiskey, wine, many books and a fishing rod - don't ask) on the shinkansen to head to Tokyo. The Shinkansen is a joy to ride, covering the 500 km in about two and a half hours. The journey was smooth and almost silent, save for an orchestral man sitting, sleeping two seats away. So, I'm now at Tokyo University which has a rather beautiful campus here at Hongo, not far from Tokyo central station. I'm meeting with Professor Imamura to discuss some work I've been doing and will be presenting a talk tomorrow (Friday). The string theory group here is large and experienced and so my talk has to be adjusted from the seminar I've been giving for the last few months (not that I haven't been talking to experienced groups, but that the ratio of string theorists to non-string theorists is much higher here). I gave this talk on Monday in Kyoto and got a lot of good questions and I expect more tomorrow. Should be fun. I'll try and post some more over the next couple of days but things are busy. For now, here are a couple of photos from the train. 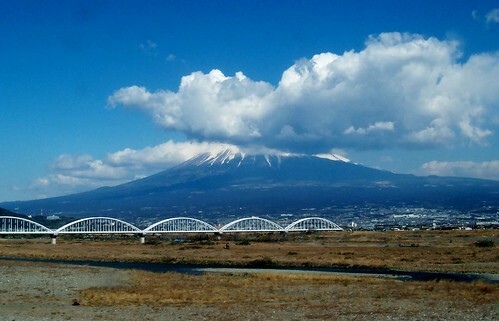 Fuji was as stunning as last time I saw it, a year ago, but this time covered in a layer of cloud. 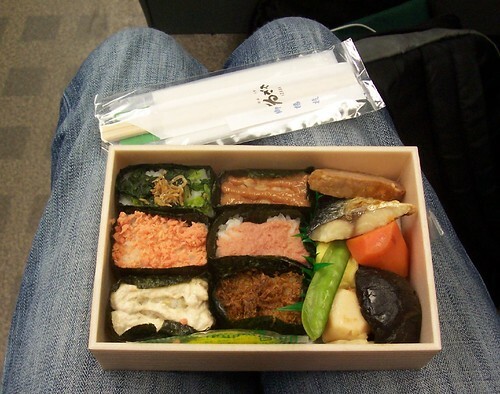 And the food on the train is somewhat better than that found at most British stations. There's a great deal to be learnt from the service industry in Japan. OK, more to post soon, including the weekly world-in-blogs summary. Though I'm staying in a flat in Kiba at the moment I will be moving to Ochanomizu University on Sunday for a week or so and should be able to catch up a little on Sunday evening. You do get about a bit. Forgot all about the fishing rod - your mention of it made me chuckle. You're a good man, Biscuit. It's been an amusing voyage with the fishing-rod. The number of old ladies almost knocked down is roughly equal to the number of elbowings I've received from them in the busy trains and temples. I think I will leave Japan with a draw.